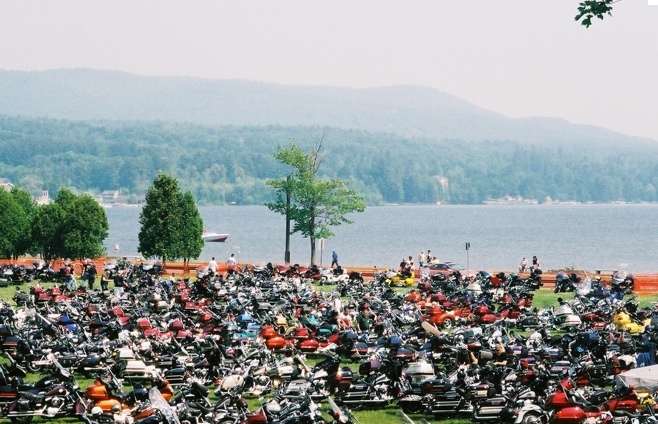 From the roar of Harley and BMW engines, to the neatly lined up assortment of bikes along Main Street, there’s no mistaking that the economic impact of Americade will be felt this week at Schroon Lake. On the eve of the nation’s largest gathering of bike enthusiasts assembling in and around Lake George this weekend, we heard from a number of Schroon Lake businesses about what this annual event means for the local economy. Schroon Lake Bed and Breakfast owner Sharon Piper says she and her husband Mark are seeing an uptick in bookings as a direct result of Americade, with “Thursday and Friday nights sold out”. “It's very important and a good way to start the season. It's a nice boost for us in a slow time between Memorial Day and July 4th,” Sharon said. When we caught up with Councilman Mark Whitney, he’d just seen a large group of Americaders in Schroon. “I just passed 60 happy bikers posing for a group picture by the Lake this afternoon,” Mark said. He’ll be checking with business owners in the coming days to get a feel for how they benefited this year. Sharon Piper hopes the bikers attracted to Schroon Lake by Americade will become repeat customers throughout the year. “It creates a lot of repeat business because participants will visit us again during a different time of year. We have guests that come for fall foliage on their bikes and have a ball”. So what are your thoughts about the economic impact on Schroon that Americade brings the town? What else could the town do to help boost the bottom line of area businesses?